Agrismart are pleased to announce a partnership with Lancashire Log Cabins to support farm diversification projects. This is a very exciting opportunity to offer a solution for farmers looking at the opportunity of diversifying into farm accommodation for farm stays. Farm stay holiday lets are a popular choice for farmers, for one thing farmers prime asset is agricultural land in a scenic setting. The other thing that makes holiday accommodation as a farm diversification popular is that it provides an extra market for their farm produce, and offers the ability to sell direct to the public for a higher profit, rather than losing some of their hard earned money to a third party retailer. Glamping has become incredibly popular over the last few years and has opened up the camping market to people that would have never considered it before, due to the more glamorous side of glamping. With the glamping option offering luxury and home comforts into the equation there is now a lot larger avid audience, log cabins or lodges being particularly popular and generating higher occupancy rate and return. Mark Hayes of Lancashire Log Cabins approached Agrismart as he could see there was a good fit with our business for his log cabins. He felt that rural, equine and farm diversification was a good market for his hand crafted log cabins, lodges, pods and shepherd huts. Agrismart will be working with Lancashire Log Cabins to bring you hand crafted log cabins and log built designs of various sizes from log furniture, small log pods, shepherds huts or mobile homes on a chassis to one bedroom holiday let’s, or even two bedroom log homes. All log cabins are built using Western Red Cedar or Douglas Fir, which are known for their strength, durability and resistance to rot and damaging fungi. Logs from a woodland on a farm or equine site may be used if suitable. Each log for the log cabins and lodges is stripped of bark with a draw knife and worked using traditional hand tools, axes chainsaws, adzes etc. The logs are then treated with a borate solution for year round protection and a final finish of the buyers choice will be applied to enhance the colour of the logs and add protection from the weather and Ultraviolet light damage. Log cabins are lined internally with sheep’s wool insulation which increases the thermal capabilities of the log cabin build, and keeps excess heat out during the summer and the warmth in during the winter. 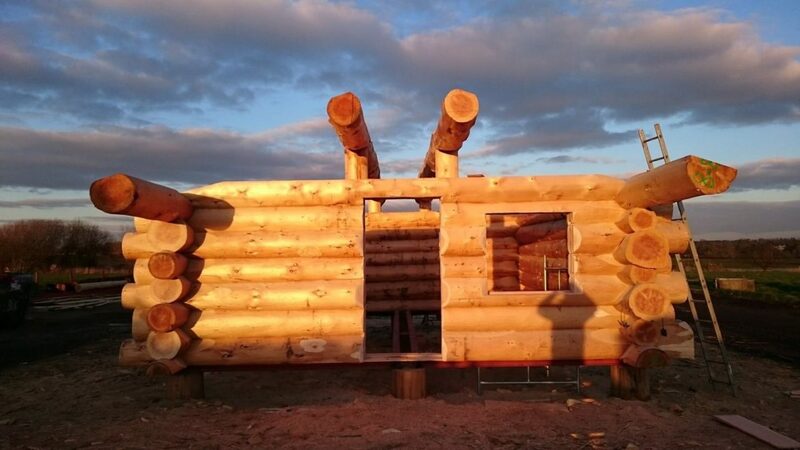 There will also be the opportunity to commission bespoke log cabin, lodge or log built projects which Mark will work closely with farmers and equestrian businesses to ensure the build goes to expectation and suits the businesses needs and importantly, their budget. Any roof finish can be applied, or any type of external doors/windows can be fitted. Extra external/internal features can be supplied on request and if a client would like to provide their own fittings we will happily fit on installation of your log cabin. All the log cabins or lodges are handmade in the UK using traditional methods and supports traditional British manufacturing. All constructed from hand from the raw material using Eco-friendly and sustainable materials to create beautiful, solid, reliable designs. If you would like more details for your own equine or farm diversification into glamping, whether it’s yurts, glamping pods, luxury glamping pods, or hand crafted log cabins or lodges email info@agrismart.co.uk or fill in the form below.